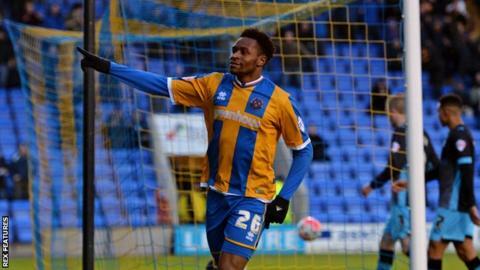 Jean-Louis Akpa Akpro's late header helped relegation-threatened Shrewsbury pick up a vital point against Bradford. The promotion-chasing Bantams took the lead when Tony McMahon's whipped cross was headed in by Jamie Proctor. But Akpa Akpro beat keeper Ben Williams to the ball with six minutes left to draw Shrewsbury level. Fourth-placed City are six points off a League One automatic promotion place, while Shrewsbury are 20th, two points clear of fourth-from-bottom Blackpool. Micky Mellon's side have two games in hand over his former club, but Town's next three matches are all against promotion-chasing sides. They are now at home to eighth-placed Sheffield United on Tuesday night before trips to sixth-placed Gillingham and third-placed Walsall. "You have to dig in and keep fighting. It's very tight at the bottom and tense, but we need people who can believe. "We didn't compose ourselves in the first half - but we kept battling away. You always get an opportunity at some stage in the game and we got one fall our way. "The substitutions worked and gave us the battling qualities we needed to get back in it, but it's frustrating because we're trying to find a system that works." Match ends, Shrewsbury Town 1, Bradford City 1. Second Half ends, Shrewsbury Town 1, Bradford City 1. Hand ball by Lee Evans (Bradford City). James Wallace (Shrewsbury Town) wins a free kick on the right wing. Sullay Kaikai (Shrewsbury Town) wins a free kick on the right wing. Attempt saved. Tony McMahon (Bradford City) right footed shot from the left side of the box is saved in the centre of the goal. Corner, Bradford City. Conceded by James Wallace. Attempt missed. Steve Davies (Bradford City) header from the centre of the box is just a bit too high. Jack Grimmer (Shrewsbury Town) is shown the yellow card for a bad foul. Goal! Shrewsbury Town 1, Bradford City 1. Jean-Louis Akpa-Akpro (Shrewsbury Town) header from the centre of the box to the centre of the goal. Assisted by Mat Sadler with a cross. James Wallace (Shrewsbury Town) wins a free kick in the defensive half. Substitution, Bradford City. Filipe Morais replaces Kyel Reid. Attempt missed. Lee Evans (Bradford City) header from the centre of the box is close, but misses to the left. Corner, Bradford City. Conceded by Sullay Kaikai. Substitution, Bradford City. James Hanson replaces Jamie Proctor. Nathan Clarke (Bradford City) wins a free kick on the left wing. Josh Cullen (Bradford City) is shown the yellow card for a bad foul. James Wallace (Shrewsbury Town) wins a free kick in the attacking half. Josh Cullen (Bradford City) wins a free kick in the attacking half. Goal! Shrewsbury Town 0, Bradford City 1. Jamie Proctor (Bradford City) header from the centre of the box to the top right corner. Assisted by Tony McMahon. Corner, Bradford City. Conceded by Jayson Leutwiler. Attempt saved. Jamie Proctor (Bradford City) header from the centre of the box is saved in the top right corner. Attempt missed. Shaun Whalley (Shrewsbury Town) right footed shot from outside the box is close, but misses to the left. Foul by Reece Burke (Bradford City).